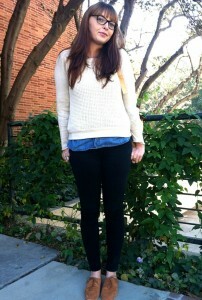 Bolger caught our eye with her simple, yet chic combination of a light sweater and denim shirt. It’s perfect for L.A.’s chilly, autumnal mornings and warm afternoons. The denim shirt adds a pop of color to an otherwise neutral outfit and the rimmed glasses complete the look. Mojo: How would you describe your style? Hilary: Situational. It depends on where I am. I dress a lot differently at school than I do when I go to work. I like to look nice but still be comfortable. M: Do you have a style inspiration? H: There’s not really one person that I necessarily look to… I definitely look to the past a lot. A lot of vintage high fashion people. M: Do you have a favorite store? H: I go to Urban Outfitters, Anthropology, Nasty Gal and a lot of thrift stores. M: Do you think having your own individual style is important? H: For me it is. When you look at somebody, whether or not you should have a snap judgment about them, you definitely do. So I think it’s a good way to get a sense of your personality across. M: Is there anything in your bag or purse that you can’t live without? H: Definitely sunglasses and lip-gloss. M: Do you have a favorite article of clothing? H: I have a pair of black boots, with a little bit of a heel, that are still super comfortable. They go with everything. M: How would you describe fashion at UCLA? H: Varied… Definitely varied. A lot better than I originally expected. There are a lot of people that are very fashion-conscious here. It’s fun to people-watch. How do you change up your look for fall? Have a friend you think we should include in our fashion feature? Share your thoughts in the comments below or tweet us @dbmojo.